Qingdao Mainflon New Materials Co.,Ltd. Qingdao Mainflon New Materials Co.,Ltd is a comprehensive enterprise, which is specialized in research and production of macromolecule materials. Mainflon is an international market oriented and also supply the domestic market. Provide high quality PTFE products, PVDF products, PCTFE products, silicone composite products, related products' manufacturing machinery and leading technology. Curently, our prodcts are exported to more than 30 important industrial countries and areas, meanwhile, our products win high reputation from Shanghai Institute of Technical Physics CAS, Shanghai Institute of Ceramics CAS, the CAS Xinjiang Institute of Physics and Chemistry, Tsinghua University, China Universty of Petroleum, Xi'an Jiaotong University, South Chia University of Technology, Shandong Commodity Inspection Bureau, The 22nd Research Institute of China Electronics Technology Group Corporation. 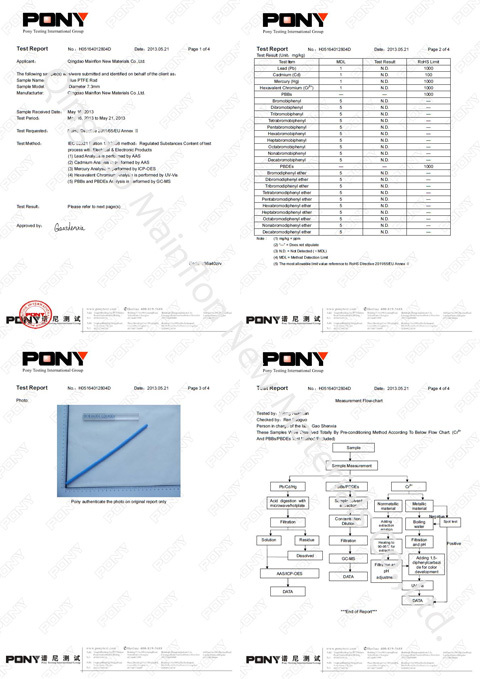 Also, we have experience to supply to Sinosteel Corporation, Aviation Industry Corporation of China, China State Construction Engineering Corporation, China Xinxing Construction and Development Company, Shandong Hi-Speed Road & Bridge Co Ltd, Port of Rizhao; Can stable supply good products to the A-share companies like Luneng Rihe Holdings, Hezong Science & Technology, Evercontaining Electric. Taiwanglass Group (Qingdao), Shun De Industry (Suzhou) Co.,Ltd, Yanling Electric Equipment Co.,Ltd (Kunshan). Shin Nisshin Seifun Foods(Qingdao) Co.,Ltd, Qingdao Nong Shim Foods famous exclusive foreign capital companies also keep good business relations with us. After many years' R&D, Mainflon developed the most advanced production technology for PTFE reprocessing powder, dozens of home and abroad companies took our technology and made outstanding economic benefits. This reprocessed powder can be used by mixed with virgin powder, also can be used alone. It can partly or totally replace the virgin ptfe resin. This technology is both environmental friendly and recycling economical, which has a widely market and good economic benefits. Our company supply full sets of manufacturing machinery and training workers. At current, only Mainflon and another German company master this core technology. Neighbouring to the Binhai Universities Scientific Research Zone, factory covers about 13500 square meters area, equipped with advanced production lines and inspection equipments. Our company emphasis on introduction and training technical personnel. Mainflon has a strong relations with several universities in Shandong province. 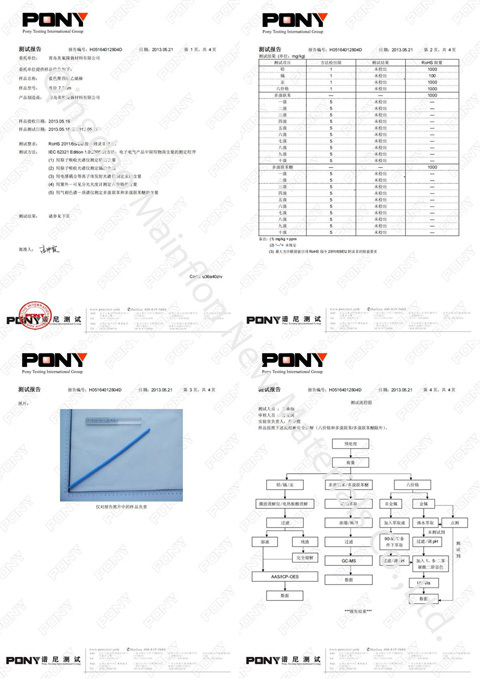 The company also stress the production personnel's study and training, being triunity of equipment, personnel and operation, to ensure the good quality and excellent service. 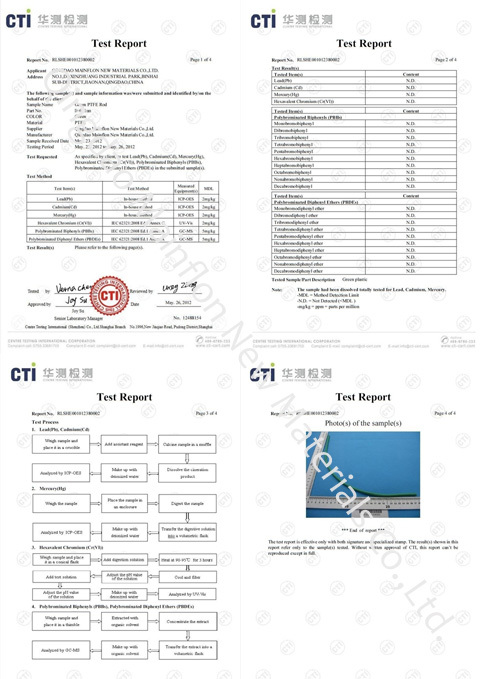 Due to our excellent professional performance in Silicon fluoride new materials and modified resin materials, we win high reputation from Japanese Dakin Industries Ltd and Japanese Kureca Inc. Our company become the designated agent of these two companies. PTFE products, PVDF products, PCTFE products, silicone composite products are widely used in aerospace, aviation, automotive, electronics, appliances, heat insulation, food packaging, plastic products,paper, printing, dyeing, clothing, chemical industry, etc. Qingdao Mainflon New Materials Co.,Ltd, relying on technology, quality, reputation and service concept, has become the leader in Chinese new material industry.